This poster was given to me last week by my Republican friend Mark, who probably won't vote for Barack Obama. It's an impressive poster- it's pop art, and kind of reminds me of something that Andy Warhol did (you know the portraits that he did of Marilyn Monroe, Michael Jackson and Mickey Mouse?). The actual artist of this poster is Stephen Fairey. 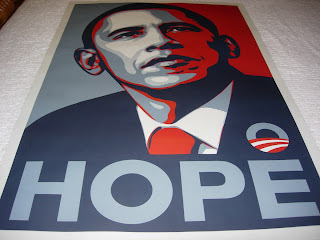 This poster, which has the word "HOPE" on it, is highly sought after by collectors. This one is a silk screen poster, printed on thick, high-quality paper. It measures 3 feet by 2 feet. It looks impressive, don't you think? This is a non-Disney item, but is nontheless quite magical. That poster is actually by Shepard Fairey (who designed the Andre The Giant/OBEY posters/stickers/grafitti that you see everywhere.) I suggest you hold on to that poster for dear life as it can fetch thousands of dollars on eBay.